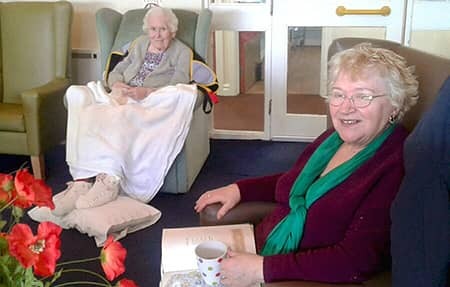 Residents at Shevington Court recently had a relaxing afternoon, filled with beautiful poetry. Shevington Court in Merseyside was recently visited by Maltese poet, Sylvie Bouqdib. Residents and staff all gathered in the main lounge area as Sylvie read a variety of her own poems, as well as some classic, well-known poems. ‘The Green Eye of the Yellow God’ by J Milton Hayes and ‘The Raven’ by Edgar Allen Poe, were amongst some of the resident's favourite poems being read. Everybody was completely captivated by the poems. One resident, in particular, Iris, loved the reading. Iris even recited the introduction of ‘The Lady of Shallot’ by Tennyson. "It is so lovely to hear the words painting pictures, it takes me back to my school days. I would love Sylvie to come again”, commented Iris. The session proved to be a great success and provided residents with great stimulation and reminiscence. Sylvie will be invited back and poetry reading will become a new, regular activity in the home.